Between the Indus and the Satluj rivers [560 km long]. 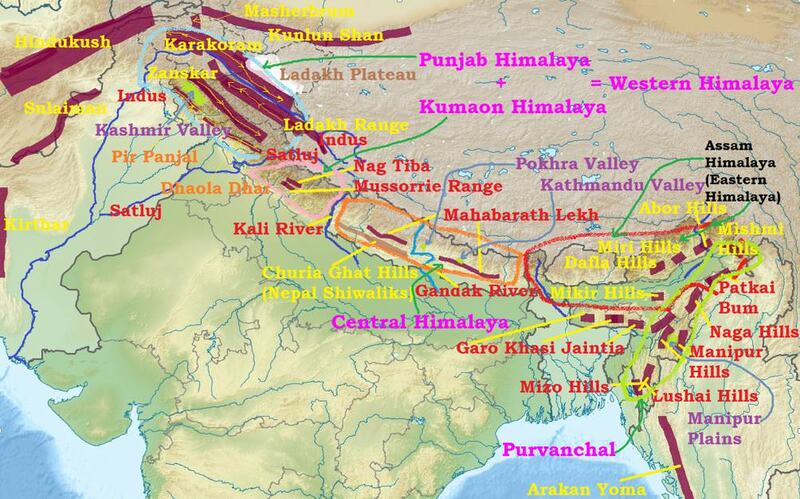 All the major rivers of Indus river system flow through Punjab Himalayas. A large portion of Punjab Himalayas is in Jammu and Kashmir and Himachal Pradesh. Hence they are also called the Kashmir and Himachal Himalaya. Karakoram, Ladakh, Pir Panjal, Zaskar and Dhaola Dhar are the major ranges in this section. The general elevation falls westwards. Spreads over Sikkim, Assam and Arunachal Pradesh. Elevation here is much lesser than that of the Nepal Himalayas. The southern slopes are very steep but the northern slopes are gentle. The Lesser Himalayas are very narrow and are very close to the Great Himalayas. Between the Indus in the west and the Kali river in the east (880 km). Spread across three states of Jammu and Kashmir, Himachal Pradesh and Uttarakhand. It encompasses three physiographic provinces namely Kashmir Himalaya, Himachal Himalaya and Kumaon Himalaya (Uttarakhand Himalayas). The Ladakh plateau and the Kashmir valley are two important areas of the Kashmir Himalayan region. 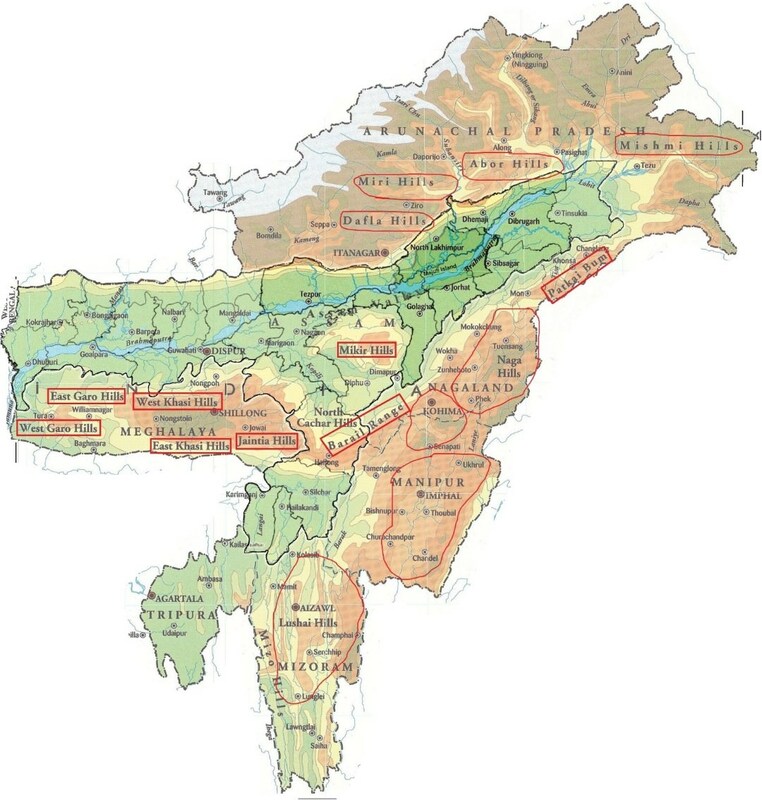 In Himachal Himalayas, The Greater Himalaya is represented by the Zaskar range, lesser Himalaya by Pir Panjal and Dhauladhar ranges and the Outer Himalaya by the Shiwalik range. The southern slopes are rugged, steep and forested while the northern slopes are bare, gentle and show plains with lakes. The Kumaon Himalayas lie in Uttarakhand and extend from the Satluj to the Kali river. The Lesser Himalayas in Kumaon Himalaya is represented by the Mussoorie and Nag Tiba ranges. The Shiwalik in this region runs south of the Mussoori range between the Ganga and the Yamuna rivers. The flat valleys between the Lesser Himalaya and the Shiwalik range are called ‘doons’ or ‘Duns’ of which Dehra Dun is the most famous. 800 km between river Kali in the west and river Tista in the east. 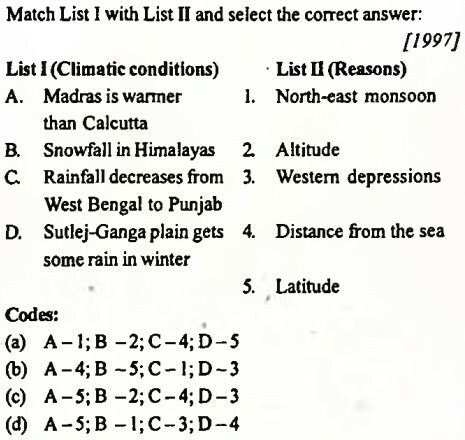 The Great Himalaya range attains maximum height in this portion. Some of the world famous peaks Mt. Everest, Kanchenjunga, Makalu, Annapurna, Gosainthan and Dhaulagiri are located here. The Lesser Himalaya is known as Mahabharat Lekh in this region. The range is crossed by rivers like Ghaghara, Gandak, Kosi, etc. In between the Great and the Lesser Himalayas, there are Kathmandu and Pokhra lacustrine valleys (previously, they were lakes). The Shiwalik range come very close to the lesser Himalaya towards the east and is almost non-existent beyond Narayani (Gandak). This part of the Himalayas lies between the Tista river in the west and the Brahmaputra river in the east and stretches for a distance of about 720 km. Also known as the Assam Himalayas, the Eastern Himalayas occupy mainly the areas of Arunachal Pradesh and Bhutan. The Assam Himalayas show a marked dominance of fluvial erosion due to heavy rainfall. The Himalayas take a sudden southward turn after the Dihang gorge and the hill ranges running in more or less north-south direction along India’s border with Myanmar are collectively known as the Purvanchal. These are known by various local names such as Patkai Bum, Naga hills, Kohima hills, Manipur hills, Mizo hills (previously known as the Lushai hills), Tripura hills and Barail range. The extension of the Purvanchal Himalaya continues southwards upto Andaman and Nicobar Islands through the Myanmar range (Arakan Yoma) and even upto the Indonesian archipelago. In the eastern section the Himalayas rise abruptly from the plains of Bengal and Oudh and suddenly attain great elevations within a short distance from the foot of the mountains. Thus the peaks of Kanchenjunga and Everest are only a few kilometres from the plains and are clearly visible from there. In contrast, the western Himalayas rise gradually from the plains through a series of ranges. Their peaks of perpetual snow are 150 to 200 km away from the plain areas.